Brace yourselves my fellow investors and landlords, the media bombardment of the Toronto real estate market crash has begun! 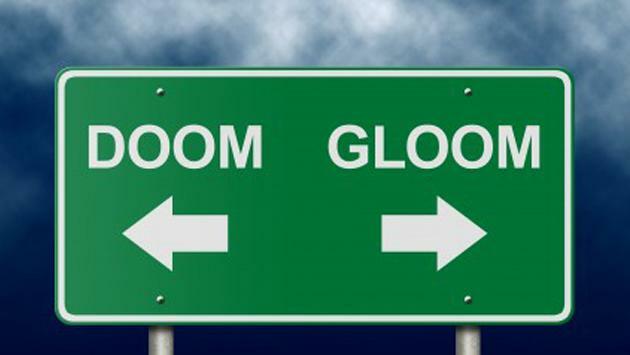 As Expected – If you didn’t get a chance to read my insight post from late January about the expected doom and gloom headlines, you can click on the link below to have a read. This week’s Insight Article is just to remind you that everything will be okay, no need to panic. Again, this was expected. Some would say that I have a crystal ball (there’s some sarcasm there if you couldn’t tell), some would say that I got lucky (reality, perhaps), but I would say that I’m just a nerd and looked at the numbers and saw this coming. Whenever you have a peak, especially a peak as high as the prices in early Q1 2017, the comparison is bound to look terrible on the descent. PPTV – In this week’s episode of PPTV, I go over the stats that TREB just released in detail in order to explain why seeing these numbers is okay and why it doesn’t mean you should liquidate your portfolio right away. I tend to agree with Tim’s thoughts on this one. If you look at the chart below, you can see that there was a giant spike in Jan 2017 and then a giant drop (relatively) back down. If you look at the trend, we can expect it to come down a tad bit more. 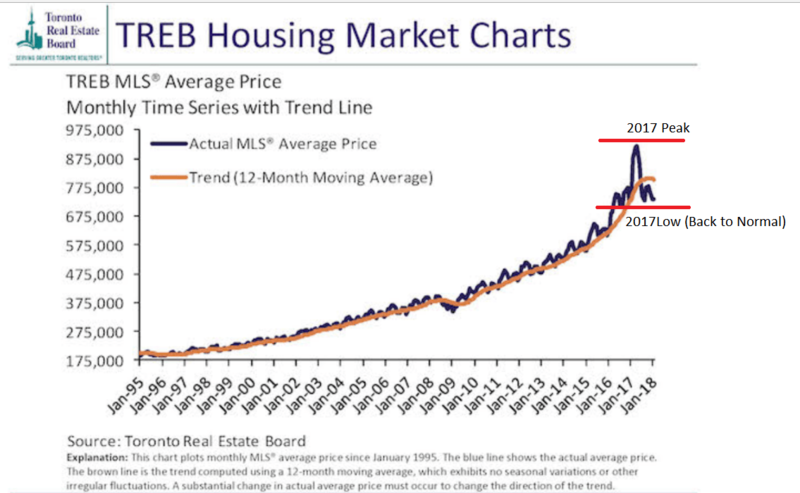 Spring Headlines Forecast: Gloomy – Unless you bought a detached house in the 905 at the absolute peak, you shouldn’t be expecting any crazy losses. If you’ve had your property prior to January 2016, you’re still rocking and rolling, so no need to worry. Do expect the headlines to continue talking about the doom and gloom for the next few months though. If you have been following my content for some time now, you’ll understand how in this current market, there is no blanket statement about the entire real estate market as a whole. The trends and stats have been chopped up into segments and localized into each individual region. Freeholds Lagging Behind – At first glance, the chart provided by TREB below looks terrible as everything is on the decline and negative. What nobody is writing about, yet again, is that the freehold houses (except for the towns in Toronto) are sitting on the market much longer or selling for less than the peak. However, the condo market is still seeing price increases despite the sales being down. As you can see below, the number of transactions is on the left (under the “Sales” heading) and average price is on the right (“Average Price”). The green highlights indicate increases, while orange highlights mean decreases. Condo Market on FIRE – If you have been in the market as I have in the last few months, you’ll even notice that all downtown condos have offer dates on them, yet again! They are also selling with multiple offers, yet again! This is exactly why the prices are still increasing despite the overall average prices being down 12%. If anything, I would say that the condo market is preventing the total average prices of the market from looking even worse. That, in reality, is how strong the condo market is right now! Affordability – At the end of the day, it all comes down to affordability as I’ve been preaching. The mortgage stress test did have an effect on the market. The lending rules implemented by OFSI have made getting any kind of mortgage much more difficult, especially a mortgage over 1 million dollars. Gone are the days where you can borrow up to 7 to 8 times your gross income. You can borrow approximately 5 times your gross income now. On a $100K family income, that’s a difference of $300K, from being able to afford $800K to now only $500K. This is why the properties going for over $1 Million have a hard time on the market right now because the credit isn’t available for such purchases. It is exactly why the most affordable segment of the market, condos, is super hot. It all comes down to affordability, folks! The Wrap – So don’t let the coming months of doom and gloom freak you out. As long as you’re not investing strictly for the appreciation, then you’ll still do great! Next Next post: Pre-Construction Condo Prices Are Primed to Increase!